Still neck-deep in planning SideQuest Community Weekend, which is LESS THAN A MONTH AWAY! Everyone here is hard at work making final preparations for another great set of events to fill your RTX weekend with community cheer. But as much as we look forward to our marquee events, SideQuest is about more than just that one weekend. We’ve been less active with our local community events lately, but that’s about to change. 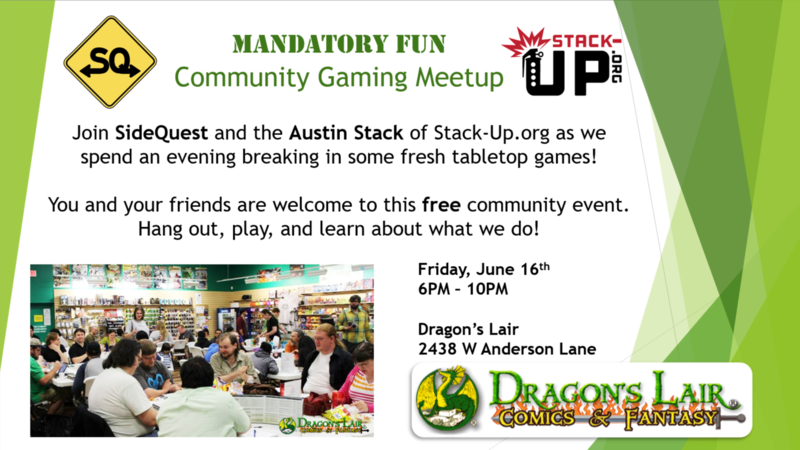 Next Friday (16 June) from 6PM to 10PM, we’re teaming up with Stack-Up for an evening of fun community gaming at Dragon’s Lair, one of the top game stores in Austin. Stack-Up is on a mission to bring military veterans and civilian supporters together through a shared love of gaming, which makes them an ideal partner for us here at SideQuest. Through Supply Crates (care packages full of video games sent to veterans all over the globe), Air Assaults (flying deserving vets to premier gaming events like E3 and Comic-Con), and the Stacks (local groups of like-minded volunteers), Stack-Up is helping veterans both at home and abroad. The Austin Stack was donated a veritable boon of tabletop and card games at PAX South earlier this year, and they’re looking for some new friends to help break them in. This community event is free and open to all, so bring your friends to meet some new faces and learn more about a great cause. See you there!